It’s all about the blues and whites, baby. My home looks quite different since the last time you saw it at Christmas time. After I put those decorations away I had a blank slate to welcome a fresh new look. 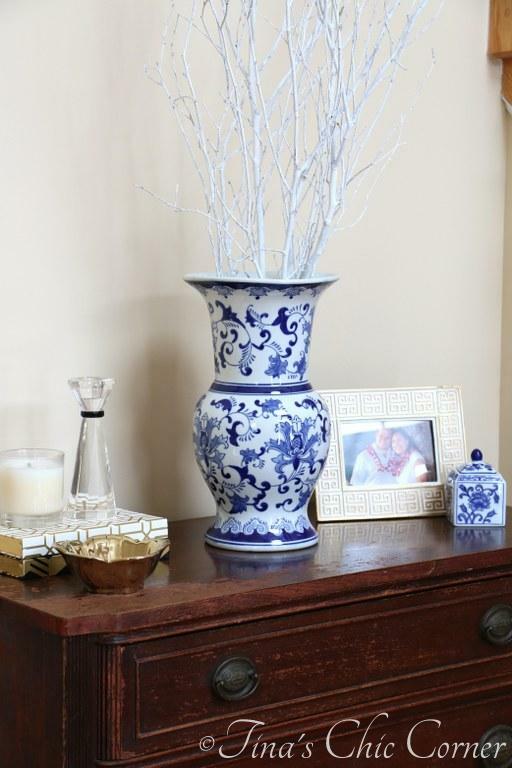 A few weeks ago I saw the blue and white floral vase (pictured below) at Home Goods and I thought it was beautiful. It put me in a cheery mood and I thought it would be a great way to welcome the warmer weather. Folks, I had found my inspiration piece for the new look. 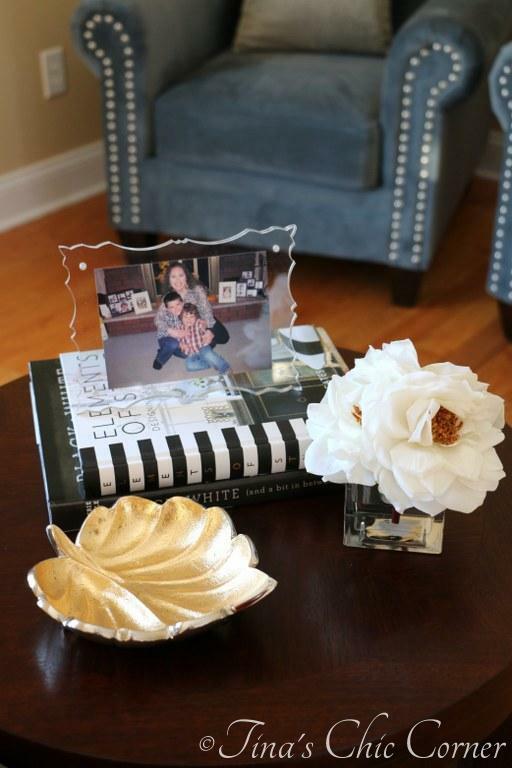 The candle, books, gold bowl and picture frame are from Home Goods, TJMax and Marshalls. Can you tell that I like to shop there? 😉 They have awesome looks for less. In fact, many of the items in this post are from those stores. The small blue and white trinket box is from Pier 1 Imports. 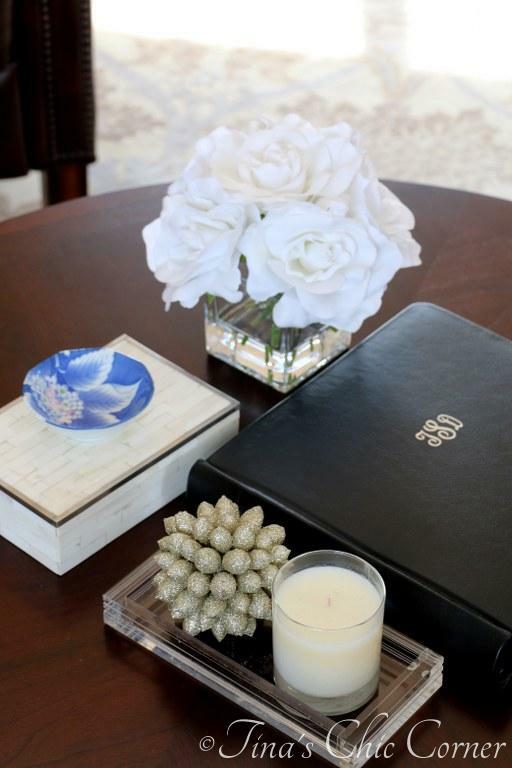 On the coffee table I focused on neutral colors and a variety of textures. Decorators say that a mix makes the look more interesting. I’m not an expert… I just go with what I feel looks good and with what I like. Yes, glitter is a “neutral.” 😉 Do you recognize the sparkly ball below? It’s actually a Christmas ornament that I had on my mantel during the holidays. When I re-decorate a room I like to look around my house to see what things can be moved around instead of packed away. Another good example is the white box, which used to be in our guest bedroom. It’s amazing how it can have a completely different look, simply by being somewhere new. The best part is that it didn’t cost me anything since I already had it. Can we talk about the candle stick holders (pictured below) for a moment? I bought three of them more than ten years ago from Bombay. These beauts have been in practically every room in two different homes over the years and now they are in our family room. See what I mean about how I move tchotchkes around? The Bombay store closed a few years ago but I recently found that they still sell online. And guys, holy cow… they have a section specifically dedicated to blue and white porcelain! Awesome. 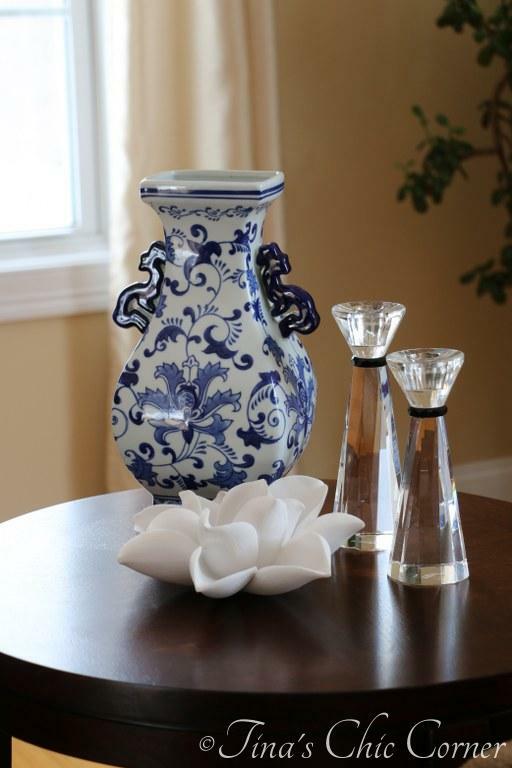 I loved the round blue and white vase that I placed in our entry way so much that I wanted to buy a second one because I thought a pair of them would make a grander statement. Of course as luck would have it, Home Goods didn’t have it anymore. However, I did find a similar one (below). I love mixing shapes so maybe it was for the better that I found something different. How are you getting your home ready for Spring?